This 6cm long tiepin is made from sterling silver and is made by hand. It is a beautiful gift and also is seen worn by gurkha officer on their tie and uniform. This 6cm long tiepin is made from sterling silver and is made by hand. It is a beautiful gift and also is seen worn by gurkha officer on their tie and uniform. 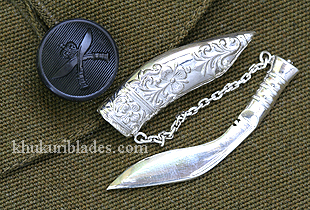 The blade of this tiepin can be put in or pulled out of its hand carved silver case like the Kukris.